364 pages | 37 B/W Illus. This book presents the diversity of recent advances in carbon nanotubes from a broad perspective that will be useful for scientists as well as for graduate students and engineers. Presenting leading-edge research in this dynamic field, this volume is an introduction to the physical concepts needed for investigating carbon nanotubes and other one-dimensional solid-state systems. Written for a wide scientific readership, each chapter consists of an instructive approach to the topic and sustainable ideas for solutions. Carbon nanotubes, with their extraordinary mechanical and unique electronic properties, have garnered much attention in recent years. With a broad range of potential applications, including nanoelectronics, composites, chemical sensors, biosensors, microscopy, nanoelectromechanical systems, and many more, the scientific community is more motivated than ever to move beyond basic properties and explore the real issues associated with carbon nanotube-based applications. Carbon nanotubes are exceptionally interesting from a fundamental research point of view. They open up new perspectives for various applications, such as nano-transistors in circuits, field-emission displays, artificial muscles, or added reinforcements in alloys. This book reviews the recent progress in modeling of carbon nanotubes and their composites. The advantages and disadvantages of different methods are discussed. The ability of continuum methods to bridge different scales is emphasized. Recommendations for future research are given by focusing on what each method has to learn from the nano-scale. The scope of the book is to provide current knowledge aiming to support researchers entering the scientific area of carbon nanotubes to choose the appropriate modeling tool for accomplishing their study and place their efforts to further improve continuum methods. 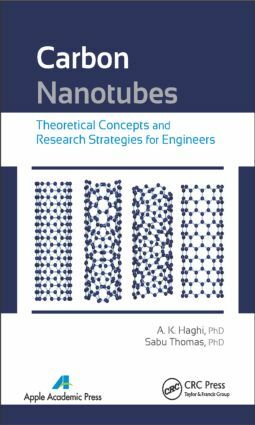 "This is a book on simulation and modeling applied to problems connected to carbon nanotubes. The selected mathematical notation is very clear to engineers and physicists. Additionally, the authors give a list of mathematical symbols, and the 37 illustrations in the book are quite instructive. At the end of the book, there is a list of 192 references connected to nearly all aspects of the topic. … This book is recommended to everyone who wants an introduction to modeling and simulation." A. K. Haghi, PhD, holds a BSc in urban and environmental engineering from University of North Carolina (USA); a MSc in mechanical engineering from North Carolina A&T State University (USA); a DEA in applied mechanics, acoustics, and materials from Université de Technologie de Compiègne (France); and a PhD in engineering sciences from Université de Franche-Comté (France). He is the author and editor of 165 books as well as 1000 published papers in various journals and conference proceedings. Dr. Haghi has received several grants, consulted for a number of major corporations, and is a frequent speaker to national and international audiences. Since 1983, he served as a professor at several universities. He is currently editor-in-chief of the International Journal of Chemoinformatics and Chemical Engineering and Polymers Research Journal and on the editorial boards of many international journals. He is a member of the Canadian Research and Development Center of Sciences and Cultures (CRDCSC), Montreal, Quebec, Canada. Dr. Sabu Thomas is the director of the School of Chemical Sciences, Mahatma Gandhi University, Kottayam, India. He is also a full professor of polymer science and engineering and the director of the International and Inter University Centre for Nanoscience and Nanotechnology of the same university. He is a fellow of many professional bodies. Professor Thomas has authored or co-authored many papers in international peer-reviewed journals in the area of polymer processing. He has organized several international conferences and has more than 420 publications, 11 books, and two patents to his credit. He has been involved in a number of books both as author and editor. He is a reviewer to many international journals and has received many awards for his excellent work in polymer processing. His h Index is 42. Professor Thomas is listed as the 5th position in the list of Most Productive Researchers in India, in 2008.